Can a small program find a perfect scoreboard? The VSBX-236LED just might make you think so. This outstanding scoreboard features the same heavy-galvanneal steel construction, powder-coat finish and five-year limited warranty as every Varsity Scoreboard product, as well as 15-inch amber and red super-bright 100,000-hour LED displays. The VSBX-236LED incorporates big league function into a compact cabinet at an absolutely unbeatable price. Boardware Software turns your laptop into an alphanumeric scoreboard to project on your pool wall. Driven by IST's timing software, Boardware gives you an easy-to-read 32 characters per lane line and a scrolling header line. Boardware is recommended for pools with minimal natural light. It requires a projector with sufficient lumen rating to show a bright image, and a screen surface for the best display. 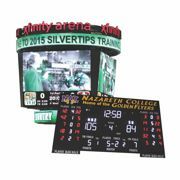 All American Scoreboards has been providing scoring solutions for more than 80 years. The latest 8000 series scoreboard lineup features built-in polycarbonate shatterproof digit/face panels for complete protection up to 100 mph. No protective nets or screens required. The wireless user-intuitive control console with built-in rechargeable battery power can operate any combination of scoreboards at any facility. Made in the USA and UL approved. The multisport scoreboard from Colorado Time Systems is an ideal solution for facilities that host multiple sporting events. The multisport scoreboard features integrated 2.4GHz wireless technology. These scoreboards can be permanently mounted on the wall or placed on a caddy (as shown) for portability. OES Scoreboards is a manufacturer of electronic scoring and timing solutions. Scoreboards are located in venues ranging in size, including Olympic facilities, and used by professional teams at the NBA, NFL, NHL and CFL levels. Many local schools and sport complexes are home to standard and custom-designed scoreboards throughout North America. From Real Time Clocks to Portable Shot Clocks to Custom Baseball, Basketball, Football and Hockey Scoreboard, OES design engineers are able to configure scoreboards to suit customers' exact requirements. Packing large scoreboard technology into a small case, the Eversan Model 9521 outdoor/indoor portable tabletop scoreboard is the perfect addition to any program big or small. This versatile scoreboard features 6-inch ultra-bright LED digits and a loud horn, making it easy for participants and fans alike to see and hear during contests. The rugged aluminum case helps protect the scoreboard from the bumps and bruises that often take out its plastic counterparts. Model 9521's small size and convenient carrying handle makes transporting a breeze.